This time I want to draw your attention to office wear. Everyone dreams of a perfect work outfit and it’s no wonder why, as we all want to look our best during office hours. Today you are about to see different outfit ideas made by fashion blogger Chriselle Lim. Take a close-up look at these eye-catching and inspiring looks you all can copy this year. We see a versatile power suit consisting of a sophisticated blazer and shortened trousers completed with orange pumps. The result looks and feels minimal, chic and classic. This outfit will easily shake things up. If you want to brighten up your office look, then start from a good pair of trousers. Pants can either make or break your outfit. Take a look at these gorgeous grid print bottoms with an easy and breathable fabric. I personally love these trousers for a grid pattern which makes a fun appearance underlining your personality. The trousers are slim, flattering, but also loose enough to feel comfortable. Oh, I love the peg-leg silhouette and the way they are styled with a white short-sleeve button-down shirt and chic heels. This outfit is both casual and chic looking. Next outfit is ideal for cold weather days when you want to wear layers, but do it in a stylish way, without looking bulky. Here we see a perfect look that features several layers, where the first is super warm mock neck sweater in skin-tight fit, then goes the second layer – a classic white button down and the final layer is a pair of workout leggings that are unseen but ideal for cold season weather. Layer up all these layers with a white jumpsuit in black stripes. It’s time to mix up stripes! I am a big fan of mixing prints, and here we see Chriselle Lim doing things right, as she created a super cool office outfit mixing two different stripes, where blouse dominated the whole look. I like the way stripes contrast each other. 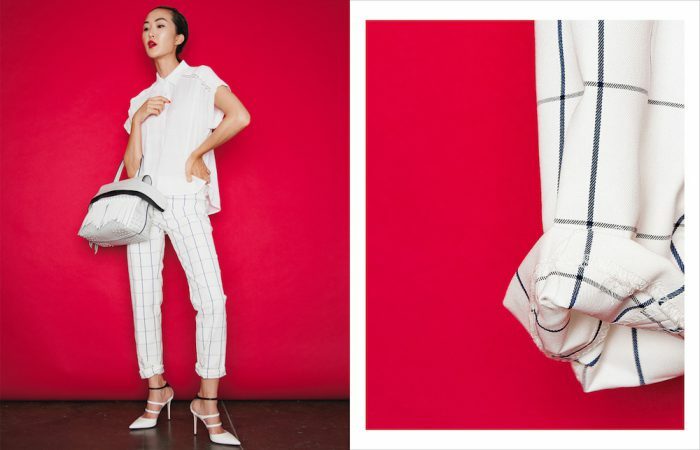 The blazer comes with a subtle pinstripe which compliments the blouse and Rachel Comey jeans. Oh, I am so in love with these killer heels from Balenciaga and Paco Rabanne bag. It’s time to invest in a vest! How about wearing a sweater vest to work? It is a nice complimentary layering that can make you appear professional and timelessly chic! Take a look at this slightly cropped and super fuzzy vest with a subtle mock-neck and zebra print pattern in burnt orange, it really makes sense to be used for work hours! Chriselle layered it over a cool bell-sleeved button down. The outfit is complemented wit a pair of dark wash frayed denim and sleek pumps. Florals work great with professional looks. This beautiful white blouse in sweet floral print looks feminine, but the overall outfit is edgy, thanks to a pinstriped suit. The androgynous outfit is complemented with florals and I love it! The color palette is great and the dark roses do their job adding a moody vibe to its wearer! The look is finished with pointy pumps and studded bag. Okay… how about wearing a creative office outfit? Go crazy and try on a pajama look! A sleepwear inspired look is always fun and easy to wear. You can mix and match things with slip dresses, lace camisoles, but I suggest you start from a classic silk pajama. You will need sleepwear inspired trousers and trench that can be worn in your everyday life, even during office hours. So, you want to look edgy, right? If so, then Chriselle offers a super outfit for working hours and it consists of a girly white midi skirt in star print, sleek black leather jacket, and simple black v-neck. The result is a perfect mix of masculine and feminine. The outfit is complemented with black boots, sleek sunglasses, and a quilted bag. So, what are your thoughts? Did you like all these outfit ideas? What do you think? Tell me in the comments below! Thank you!